Katapult were intrinsic to the overall vision and ultimately, contributed to the successful delivery of Manheim Bruntingthorpe. 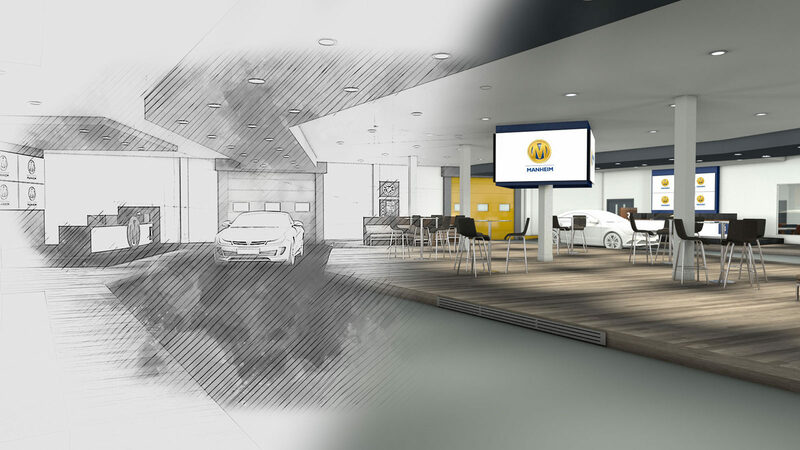 They delivered a complete end-to-end customer experience strategy, from concept development, through to understanding the Manheim customer needs and complete visual execution. They provided exceptionally high attention to detail; all delivered through CGI visualisation for the interior theming and video walls, and branding and theming our new food and beverage area. It’s now recognised as a global industry’s flagship auction centre, delivering commercial success and exceptional high customer satisfaction. How do you create a state of the art vehicle auction site, the first of its kind in the UK? 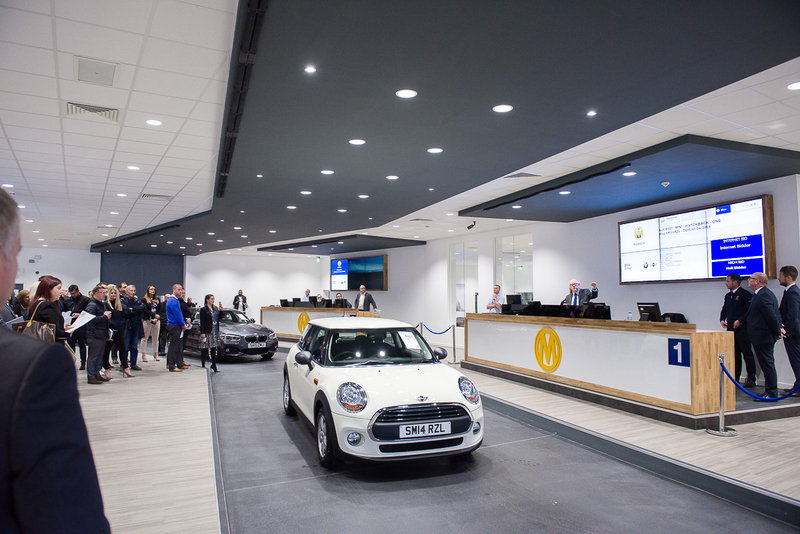 Manheim needed our expertise in Guest Experience as they introduced a unique auction centre at Manheim Bruntingthorpe. They wanted to introduce a “double-blocking system” that would allow them to offer four vehicles for sale simultaneously – doubling their selling capacity at any one time. 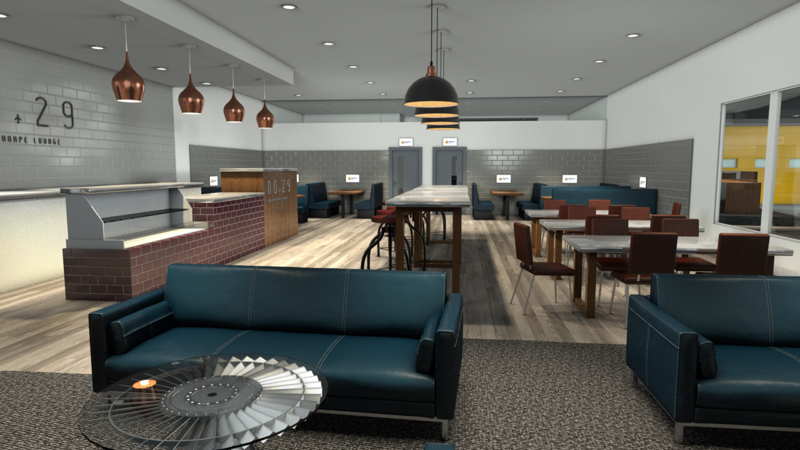 The theme in automotive catering had been convenience, we wanted to create a location – a space where customers and clients could network and enjoy the time spent at Bruntingthorpe. 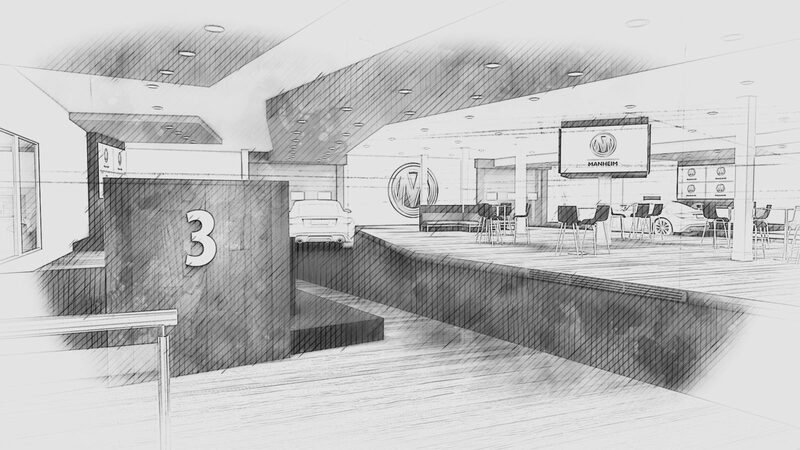 We created a space with areas for clients to hold meetings and display screens that offered details of vehicles on sale as well as messages from partners. As well as the double-blocking system we also revamped the cafe at the site. When creating the look and feel of the site we researched guest flows revealing the customer type and behaviours.We found that buyers of higher-end cars were visiting this site much more than any other buyer. We delved into the heritage of the area too – Bruntingthorpe was an airfield used in World War II and has a strong aeronautical background. For those reasons, we created a space that was more executive and had a nod to the aviation history of the site. The launch of Manheim Bruntingthorpe ran from Monday 25th – Friday 29th September and exceeded expectations; more than 1,400 people attended, both at the venue and online. Manheim also achieved a 100% sale conversion at the inaugural BMW group auction on the Monday and sold over 1650 cars across the week.